That is adorable! I've just discovered your blog and loving it. What a sweet idea! It's so pretty. You are so crafty. Love it! QUÉ LINDO!!!!!! !how beautifull!!!!!! !and l like watching you there in the machine working!! 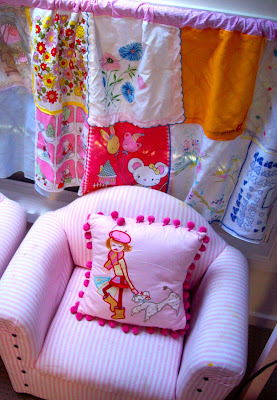 !l think your daughter will be very very very happy with her new joyfull beautifull vintage and unique curtain!!! have a very happy weekend!!!!!besosss!!! I am so thrilled you did this post, Simone as I have been itching to do a similar thing. I am pants at sewing but I'll have a bash. Oh, first I will have to collect enough hankies. I have enough for my daughter's dollhouse at the moment. 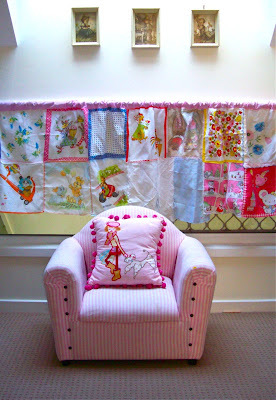 I also saw another lovely idea of converting your children's favourite clothes into quilts! I loved that as some of the dresses ets are hard to part with. Your daughter is one lucky gal...so so lovely..I guess I need to start collecting vintage hankies now! That is really wonderful! You know when I saw your earlier post on the hankies I thought 'curtain!' but I didnt say anything - and look what you made!!! You should be very pleased with what you have made. It looks divine!! You are one clever Sheila! Get ready for lots of copycats. the curtain is adorable!! You have been busy lately I loved looking at Apartment Therapy and your vintage fabric pencils! gorgeous!!! Beyond cute! Such a clever gal, making such a happy home. What an amazing collection of hankies you must have if this is only half of it. Its looking very cute, your lil girl is very lucky to have such a creative mum. Loving that pink chair n pom pom cushion too. Simone, great to see all those lovely hankies fluttering about and showing off all their pretty colours. What an excellent result for something that took only a couple of hours! Nice work!! lovely idea! 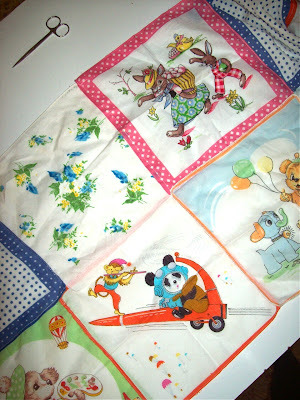 i made a shabby, imperfect and wonderful quilt for my first baby from my childhood hankies, but now wish i had more. glad i discovered you, thanks to josephine! Well done, these are adorable! So cute! What a great idea for a child's room. Adorable! I need to figure out how to use my sewing machine so I can attempt to make cute things like that. These are adorable for a girls room. 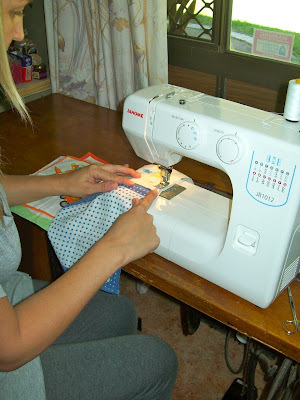 It's a very long time ago since I operated a sewing machine! Very, very cute! It looks like you can sew just fine. Good job!!!!! This is so sweet & clever. this is adorable and gulp, inspiring. i have yet to make anything with my sewing machine and it's almost 2 years old. this looks, gulp, do-able. So sweet... love love love what you have done.. you have such a talent!!! What an original idea, it's absolutely brilliant! hello, how adorable is that curtain?! I bet your little daughter loves it. Oh, how delightfully creative you are! So glad I found you. 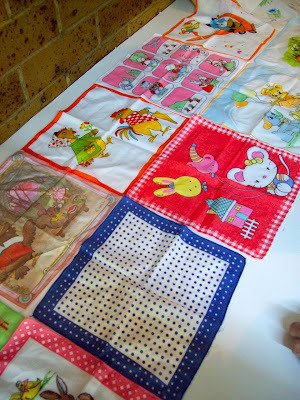 hi Simone...gorgeous lot of vintage hankies..
wish I had have had a daughter!! (not whingeing...love my TWO ADULT BOYS!! )...But just never got to experience girlie thingeys!! ps...DONT mention grandchildren!!! (jee wiz..they are just 22 & 20 yrs old)!!! look forward to your next post.. I love this! I have many, many vintage hankies, and you have inspired me with this project! This is so pretty! Great idea! I bet she loves it! Oo I love it, well done! I think the result is LOVELY! You must be so happy! Absolutely adorable. Very sweet for a little girls room. 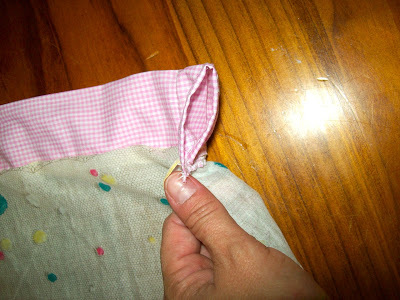 Thanks for the step by step...now I just need to learn how to sew! from someone else who also collects vintage hankies this is just sooo sweet. great job! adorable curtain! I was in a local consignment store yesterday picking up a few vintage hankies to make a pennant banner (see my blog) and she told me about making a bed dust ruffle out of vintage hankies, same idea as your curtain. SO...thinking this was a fab idea, I am now going to be on the hunt for more, more, more hankies...which by the way are super hard to find here! I just came across your blog. Love the curtain, such a cute idea! LOVE IT!! I'll be linking tomorrow! Let me know if that's not okay. This is adorable...like the curtain..easy to follow.